To commemorate the centenary of the outbreak of the First World War 888,246 ceramic poppies are being installed in the Tower of London’s moat. 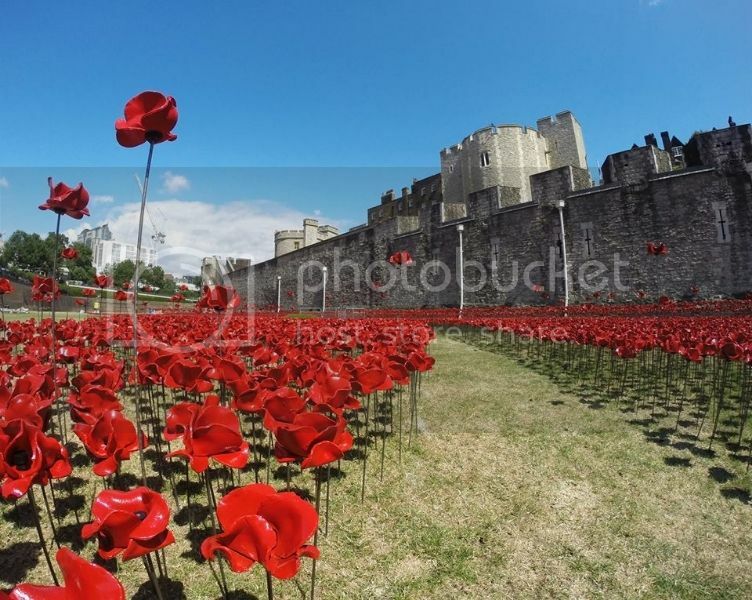 The art, called Blood Swept Lands And Seas Of Red, represents one poppy for each dead British soldier in WW1. They have gone on sale which means millions going to military charities. I think it's a wonderful idea and ordered one today in memory of my Great Uncle Maxwell born in Govan 1896 and killed in action, Gallipoli 1915. It's good because a friend of mine is going soon on a cruise and is dropping off at Turkey where the Helles Memorial is built in memory of those poor souls. I have had a lovely plaque made and my friend is going to leave it there although I do intend to visit the memorial myself. On the scroll that my great-grandparents were sent on their son's death it reads: Let those who come after see to it that his name be not forgotten. I like the opportunity to do just that. Here's a little story, loosely connected to the great war. Many years ago I was broke and not getting much from the dole, so I decided I had better do something for myself as no bugger was about to do it for me. I aquired a ladder and a bucket, and then went knocking on doors to see if anyone wanted their windows cleaned. In a short while I built up a good size round. Most of my customers were old couples and old women. As time went by I would notice the grass getting higher in their gardens and other little things. It was then I decided to try and offer myself in a very sly way. Sly, because most of these elderly folk had lots of pride. So I would turn up at some of their houses in the afternoon and say I'd seen their grass was a bit long and as I loved a wee bit of gardening could I possibly spend some time in their garden. I also added that if I wasn't doing that then I would be down the pub and that they would be doing me a great favour by giving me something to do. Most of them fell for it and I had my regular little stints of cutting grass, painting window frames, unblocking drains etc. I never took any money off the old folk, all I got was a cup of tea and the priveledge of listening to stories about their lives. However, one house was the home to two sisters, in their mid nineties by then and they were ever so lovely, from a different age with different manners. They both liked a tipple and had a brewery wagon deliver a crate of beer to them once a week. When I had finished doing all the wee jobs that needed doing the two sisters would invite me in for a glass of beer. It was then that things really got interesting and I got what I came to consider my "payment". They would regail me with so many stories about their younger days, how they were both in service in big houses, one sister in one, the other in a different one. On a Sunday afternoon they both had their half day off and would meet up by the river bank before meeting their sweethearts and making their way to the bandstand where they would sit and listen for a while, eventually going to a cafe for a cup of tea and a slice of bread and butter. Sometimes they splashed out and had a cake. Both of their sweethearts were soldiers and eventually the two girls asked the Master and Mistress for permission to marry. Permission was duly granted and they both married at a registry office on the same day. One sister remained in service, waiting for her new husband to find a house, while the other moved into a little terraced home with her husband. World War One came and the two husbands went off to fight and the sister still in service found herself homeless and jobless when the Master and Mistress emmigrated. She moved in with her sister, only for the duration of the war. Both their husbands were killed at The Somme and the sisters never married again. They were still living in that same little terraced house when I met them. Listening to that and all their other tales of life from a bygone age was plenty of payment for me and for all the other little jobs I did for other folk. I think one died and the other moved into a home. Last thing I knew a family of Indians were living in their house, probably unaware of it's history and the two sweet old dears who had spent a lifetime there. Martin, thank you so much for that story. I have read it through twice now as it was so interesting - from many angles. You should write those stories down because you must have a hoard of them. So many of these stories are lost to us and they make up our history. Thank you. What a truly wonderful story, I intend to have it framed, and take pride of place on the mantlepiece. My heart goes out to those two sweet old dears. Let's pray that those Indian residents, can truly understand what being British, truly means. Wonderful wonderful, so well written. TY, that's quite a compliment. Butter wasn't allowed in the servant's hall, neither was sugar, both were for upstairs only, so a cup of tea and a slice of bread and butter was quite an occasion. A cake was reserved for high days and holidays. In the world we live in now it's difficult to understand how things went on back then. Martin wrote: They were still living in that same little terraced house when I met them. Martin wrote: TY, that's quite a compliment. God, the good old days..... people certainly knew their place, a well structured society - alas.